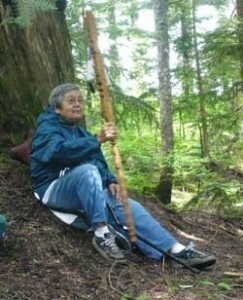 Whenever a cutblock is being planned, part of the process is engaging local First Nations in a review of the archaeological potential of the site. Each band office is supposed to have a resident, professional archaeologist on staff to assess the potential of the area for old village sites, middens, or in the case of ancient forests: culturally modified trees (CMT). Sometimes an area with high potential for CMTs is assessed as low potential and the archaeologist doesn’t visit the site. This is what happened for BCTS Block A84612 resulting in no site visit or CMT report which made the forest vulnerable to logging and a significant heritage of CMTs would have been destroyed in the process. 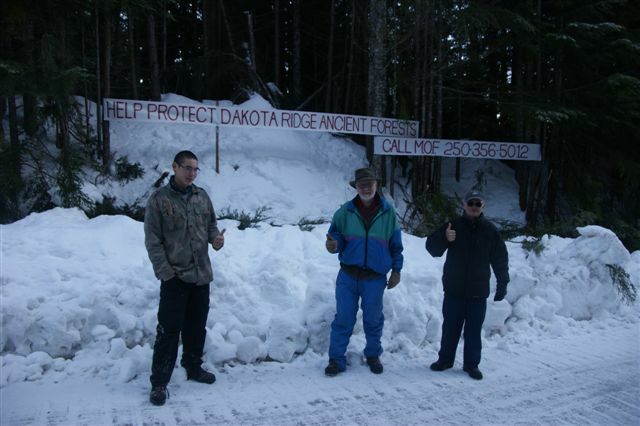 On the upper slopes (900m) on Dakota Ridge (above the Wilson Creek shopping center), a 44 Ha (110 acre) ancient forest is still under threat to clear-cut logging by BC Timber Sales. The forest is essentially a ‘cloud forest’, with many fog-shrouded days and a long season of snow cover. This produces a spongy, wet, forest floor with beautiful moss gardens and ancient cedars festooned with moss and lichens. These ancient forests of towering yellow cedar, fir and balsam are easily accessible from Hwy 101 between Gibsons and Sechelt providing a unique opportunity for the region to expand the amount of old forests that are protected. The eco-system here is very similar to the Caren Range north of Halfmoon Bay on the Sechelt Peninsula. It was here in the 1990s Provincial Park Status Park was granted, known as the Caren Range, Spipiyus (the native word for the Marbled Murrelet) Park, after local conservationists founded ‘Friends of Caren’ and along with support of the Sechelt First Nations raised their concerns about endangered Marbled Murrelet, their nesting habitat and the preservation of the ancient forests there. This Park now protects only pockets of old-growth forest and prime nesting habitat for the Marbled Murrelet. A cross-section of an 1,835 year old ancient yellow cedar tree that was cut down on the Caren Range (prior to Park status) now resides on display at the Iris Griffith Conservation Centre near Madera Park on the Sunshine Coast. This tree is approximately 6 feet in diameter and has a growth ring diameter measurement to age count of 1cm=10 years. 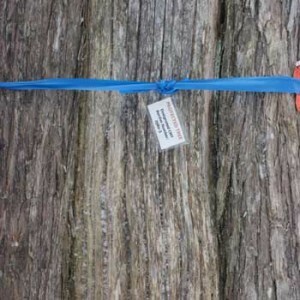 This was the longest-living tree on record in Canada- and a seedling back in 160 AD! 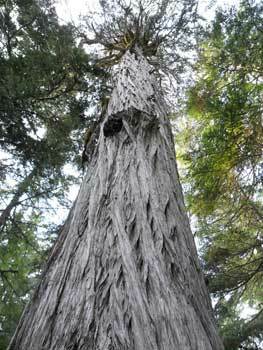 By contrast the massive ‘living’ ancient yellow-cedar, the ‘Giant Twin’ found at Dakota Ridge (shown in the pictures here), one of the two newly named ‘Giant Twins’, is approximately 203 cm, or 2.038M, or 6.68 ft. This ‘living’ tree on Dakota Ridge therefore could surpass in age the Caren Range tree and be the oldest living tree in Canada. LoggingFocus members draw close parallels of Dakota Ridge ancient forests to those of the Caren Range, Spipiyus Park and feel that not only are the ancient yellow cedar and other trees of the same age or older, but also this area represents som e of the last Marbled Murrelet nesting habitat near Roberts Creek where they have been heard and spotted fishing off the coast of Roberts Creek by a noted wildlife and birder expert in the area. This unique, highly secretive and endangered bird only nests in the mossy branches of ancient forest trees and fishes off the coast by swimming with its wings under water and will then carry its catch in its mouth and fly up to 30 to 40 km to feed its chicks. Since this is some of their last habitat in the area – where else would they go? Paul Jones, co-founder of ‘Friends of Caren’, the one that discovered Marbled Murrelets nesting on the Caren Range and a noted Marbled Murrelet authority, has said that the ancient trees at the Dakota Ridge forest and their narly mossy branches are exactly like those of the Caren Range and are ideal for Marbled Murrelet nesting. Additionally, Professor of Wildlife and Biology at SFU, David Lanck, part of the Marbled Murrelet SFU Research Team that worked on the Desolation Sound Marbled Murrelet Research program, on a recent field excursion to Dakota Ridge, agreed on the suitability of these trees for Marbled Murrelet nesting. 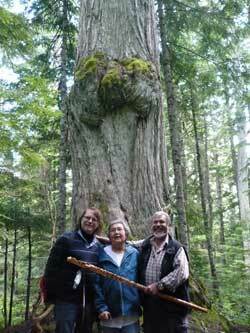 Additionally, Dakota Ridge Ancient Forests, like the Caren Range, Spipiyus Park, now has strong Sechelt First Nations support to protect and save for posterity these Ancient Forests, their traditional lands. On July 31st LoggingFocus members were honoured to take several Sechelt First Nations elders and members to view and bless these these forests. 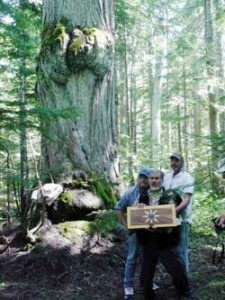 A traditional First Nations ‘Peace Pipe’ ceremony was held (with an extremely rare peace pipe) at the base of one of the majestic ancient yellow cedar trees (the ‘Giant Twin’), the ‘Talking Stick’ was passed and each member vowed to save these forests for posterity. Pictures attached. The Dakota Ridge forests are not just 250+ years old (the definition of old growth), but more in the range of 1,000-1,500+ years old (at this altitude the yearly growth period is short, the snow pack in excess of 16 feet and therefore – like the Caren Range, Spipiyus Park tree growth ring count mentioned – the approximate growth ring diameter measurement to age count is 1cm=10 years). They are truly living monuments to the past, present and future and should go into a special category of ‘Ancient or Antique Forests’ and be preserved forever. 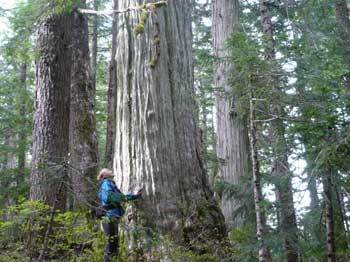 It’s estimated that less than 2% of the original old-growth forest remains after 100 years of logging in the Mt. Elphinstone map area. Block A84612 of old-growth must be immediately removed from BCTS books before it ever goes to auction. Old-growth forests provide key environmental, recreational, and cultural services that need to be recognized as economic contributors. Short-term logging revenues pale in comparison, especially in light that province-wide BCTS has been losing money in this depressed market. New ways of assigning value to intact forests shows that these forests generate up to $7,000 per hectare in services. To that end, the 44 ha forest under review provides $294,000 (yearly) in above services. On a November 22, 2010 field trip into the proposed cutblock 2 LoggingFocus representatives’ documented ancient yellow cedars and very tall firs (220+ft H). 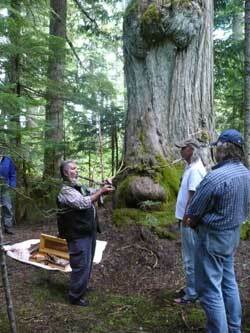 They also came across dozens of cedars that showed signs of modification by historic First Nations forest users. Pictures of the trees were sent to the Provincial Government’s Archaeology Branch in Victoria. Shortly thereafter, 2 ministry staff confirmed them to be Culturally Modified Trees (CMT) and provided the team with a Heritage Conservation number. There are now 24 CMTs tagged in one 11 ha site with possibly more CMTs to be found in the remaining 31 ha. CMT types found include: taper peels (bark harvest), notched (planks) and test-holes. The CMTs are estimated to be 150 years old or older, or pre-1846 that defines any artifact to be of significance. The forests above the proposed BCTS Cutblock contain one of the largest remaining intact jewels of old growth Ancient Forests left on the entire Sunshine Coast. This incredible swath of ancient trees extends across the slopes east towards McNab Valley, making a thin connection with the Tetrahedron Provincial Park. The area is approx. 2,000Ha in size making it highly valuable for habitat needs and as a bio-diversity bank. Some of the oldest trees in Canada grow in here, and supports a whole host of plant and animal species. Elphinstone Logging Focus sees this area containing strong potential as a new protected area. Block A84612 is under deferral until a complete archaeological study is completed across the 44Ha. Status updates can be veiwed in their entirety within the Satus tab associated with this campaign page.